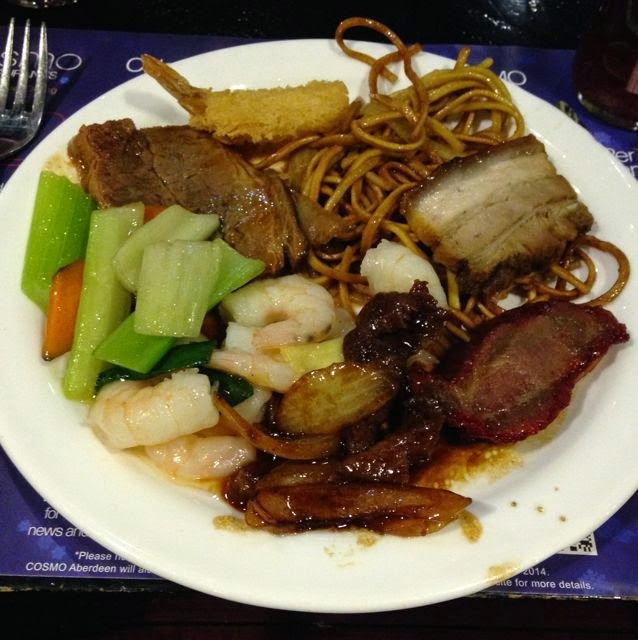 I think probably one of the most talked about restaurants in Wolverhampton is Cosmo, an all you can eat buffet. It is famous as it is well priced, and serves pretty much everything, from sushi to burgers. With Chinese, Indian, English, American, and Japanese cuisine just to name but a few there is no wonder it calls itself a ‘world buffet’. It is also notoriously difficult to get a table at, particular on a Friday or Saturday night, despite being a huge sized restaurant too. Cosmo is a chain of restaurants with quite a few dotted up and down the country. My family and I were giving it a try out on a weekday night, so thought it might be quieter. To be fair it was a little, but it was still a long way off being quiet. There was a huge table celebrating a 16th birthday, no free tables in the place and queues of people massing around the entrance, bar and thus the route to the food. Everyone seems to walk too fast and sports a technique where they jump out of the way and dodge other restaurant goers, this is not the place to go for a quiet calm night. It does however offer a pretty amazing selection of food. I opted to start with sushi, and on my first look at the sushi area found it was rather disappointing in that it had almost all gone. It wasn’t long before it was partially restocked, but the lack of varieties was the lowest I had seen in there. I should point out we used to go quite regularly to Cosmo but for one reason or another it has been almost twelve months since my last visit. 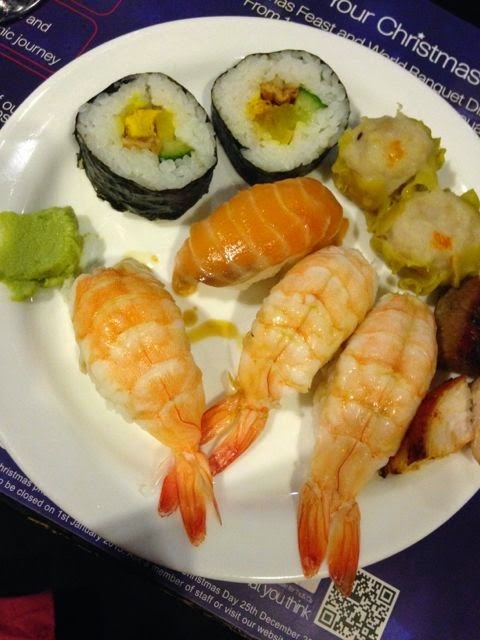 I did manage to get a selection of Sushi in the end which was lovely, and topped it up with some tender meat bits from the Amazonian barbecue area and a couple of Japanese pork dumplings for good measure. The sushi tasted fab, although the soya sauce seemed a little watery and didn’t seem strong enough to add a salty kick on the salmon. For mains I thought I would have a look at the noodle/soup counter, and keep my Japanese theme going. When I got there I saw there were about five people waiting and I could tell from their faces they had been there a while. This is the perils of cooking food fresh to order in such a busy place. I felt my time would be better invested having a look at the Chinese section, and picked up noodles, beef in satay sauce and prawns with spring vegetables. There were a couple of other chunks of meat as recommended by Spectre, as other tasters. They didn’t quite go with the Chinese aspect, but that is the fun of such a mixed buffet. You can go back as much as you want, but by this time I was feeling ready for dessert, and you never want to over fill yourself without checking out the shelves for those with a sweet tooth. Spectre’s favourite Crème Brulèe had shrunk since our last visit, instead of being in a small ramekin they were now presented in egg cups that looked about a third full. There was also none on the shelf, another family member and Spectre claiming the last two. They tasted good apparently, but the size of them was rather disappointing. I went for quite a selection of goodies, of which the highlight has to be the coffee mousse, in the picture with the sponge finger. The coffee flavour is lovely and strong and the creamy aftertaste was perfectly balanced. I think it fair to say that it is very quickly becoming a favourite dessert there. I do like jelly and don’t have it very often so stocked up a cube of lime flavour, and the quirky stripy variety. The chocolate dessert was good too, again very small, but had a good chocolate kick. I think the desserts being in such small containers does create a problem with spoons. There are some dessert spoons occasionally near the desserts, but these don’t fit the small pots they serve anyway. Getting a dessert spoon is difficult, but finding a teaspoon (that does fit) is near impossible. Staff stride past quickly on missions for something or other and my repeated ‘excuse me’ was ignored by several members. Eventually one stopped and I requested teaspoons, how many he replied, I said there were five of us and he frowned and said he’d see what he could do. We did get them, but the spoons thing has been an issue every single time we have visited the place. It is an easy fix too, you can buy multipacks of teaspoons for £1, they really need to invest! Finally my last dessert item was the rather lovely macaroon. They have a selection of flavours but the green ones have a chocolate filling, so are my favourites. I only recently realised just how good the macaroons are at Cosmo in terms of texture and flavour after we tried some from a brand in Waitrose that were expensive but inferior. Just to mention the drinks, I had two during the course of the meal. 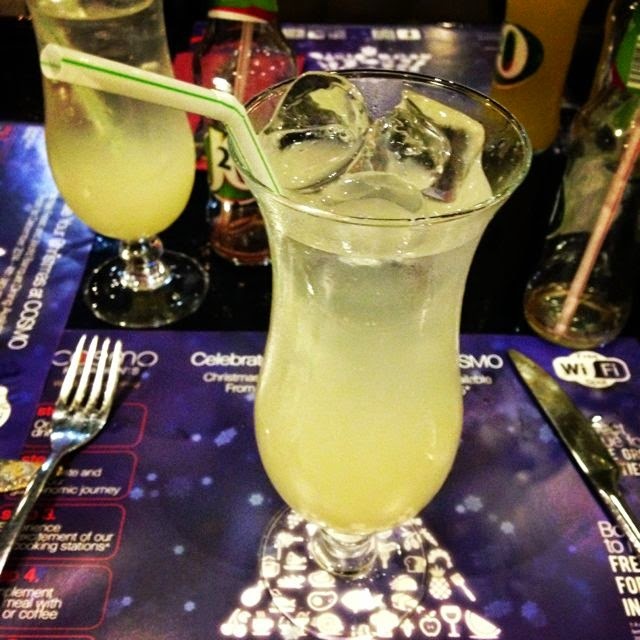 First up I had a J2O, but my second drink was a rather delicious mocktail, flavoured with Lychee. It had a lovely fresh cooling flavour, with a nice hint of sweet. It tasted fabulous and did feel like a proper treat. I love that Cosmo have added a new cocktail menu to their drinks offering and this is something I will explore again when I go back. They are perfect for the run up to Christmas too. I realise there are negative tones in this review, but we did all have a really good meal. 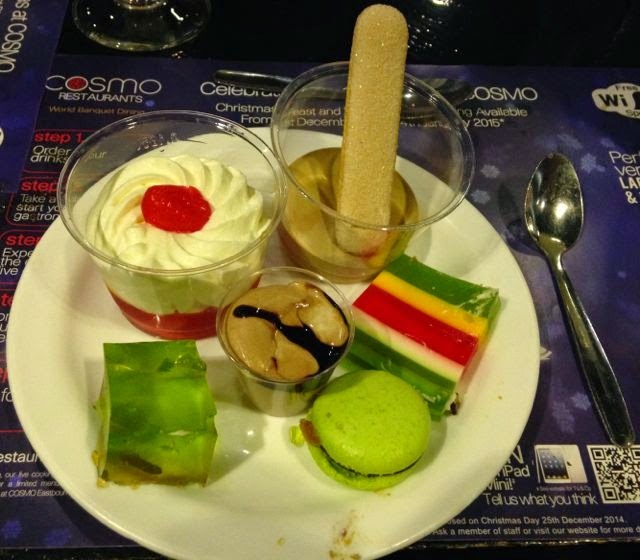 It is just a shame that Cosmo allow things like the spoons, or the stocking of the sushi bar to let them down a little. Over all if you don’t mind a noisy/busy environment you would be hard to pushed to find such a good selection of food, all of which is good quality, for the money. For us we are happy to ignore the few issues and have made a pact to go there more often as we had forgotten just how nice the food is. 89 for 5 people is a great deal for unlimited food and 2 drinks !!! Yep - midweek it is only £12.99 per person for food - and we had soft drinks. I guess that is why the place is ALWAYS so busy.